Carl Pearson (FSO-MT), center, works with Michael Piantedosi, Class of '12, left, and Nicholas Zaremba, Class of '12, right, during on of many Boat Crew classes on campus. 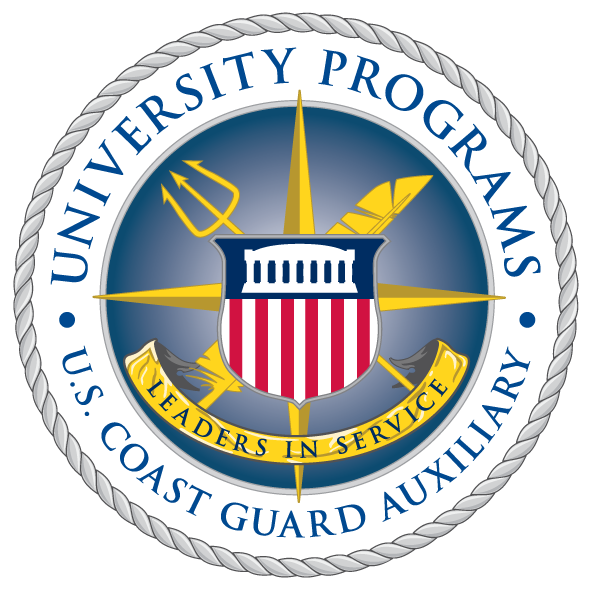 The Auxiliary is building upon the recent success of university programs such as the Detachment at the College of William and Mary, to recruit and educate a new generation of leaders. “Training Leadership Collegiate” (TLC) is a new program within the National Training Department that has recently been tasked with developing a college-level leadership and operational training program, managing existing Auxiliary programs on college campuses, and expanding the program at new host institutions. Similar detachments already operating at Auburn University and The Citadel joined William and Mary in producing promising early results over the last eighteen months. Other awards were given in addition to the conferring of graduated status on Ms Johnson, who served as the unit’s student leader during her senior year. New members from the spring semester were recognized for having completed new member training. Other students received qualifications as Communications Specialist and Instructor Specialist, and the two original students and one staff member were recognized as the program’s Plank Owners. A Coast Guard Meritorious Team Commendation was awarded to the team responsible for initially standing up the program. Speakers at the event included Johnson; Andrew Welch, Detachment Leader, program director; James Clark, Commander Flotilla 67; Heidi Derby, District Captain; Chaplain Donald Troast from the Navy’s Commander, Submarine Force; and Taylor Reveley, President of The College; Commodore Albert DeJean, District 5 Southern Region; The Honorable Michael Powell, Rector of the College’s Board of Visitors and former Chairman of the Federal Communications Commission. Johnson was initially attracted to the Auxiliary because of the opportunity for rigorous leadership training the Detachment promised to provide. The program works at the cross-purposes of preparing approximately one third of its members for application to and success at Coast Guard Officer Candidate School, and the two-thirds majority of its members to serve as a new generation of young leaders within the Auxiliary. While Johnson, who aspires to a career in international refugee work, will continue to work in the Auxiliary, her shipmate from the William and Mary program, Michael Piantedosi, has just been accepted as a transfer into the Coast Guard Academy’s class of 2013. Heidi Derby, District Captain, Sector Hampton Roads, and Gary Derby, Division Commander, at the podium, awarded Meritorious Team Commendations to L to R: James Clark, Flotilla Commander; Nancy Burns, past Flotilla Staff Officer, Personnel Services; Daniel Burns, Flotilla Vice Commander; Andrew Welch, Flotilla Staff Officer, Detachment Leader; and Emily Johnson, Detachment Commander. The program is open to all students who meet the basic requirements for Auxiliary membership and who are willing to take on the added challenge of training and education as detachment members. During the first semester of membership, students complete “Basic Auxiliary Requirements” (BAR) training, a program developed in-house and field tested for the detachment and future programs nationwide by instructors from Flotilla 67 in Williamsburg, Virginia. Most of BAR is taught by older students, and includes a heavy focus on Coast Guard Core Values and the concepts of “teamwork” and “shipmates,” as well as Coast Guard and Auxiliary history, organizational structure, correspondence and writing, ranks, rates, offices, insignia, and uniforms. Detachment members must also complete the ICS-100 training, pass a safe boating course approved by the National Association of State Boating Law Administrators, fulfill a collateral duty within the detachment, participate in the weekly “Leadership Lab," and complete a 72-item Personal Qualification Standard in order to complete BAR training and earn “Senior Status” within the program. Students then spend the remainder of their time in the program working within a chosen “Area of Concentration”—Surface Operations, Marine Safety and Environmental Protection, Public Outreach, or Organizational Management—which are structured training programs that utilize the range of operational training that the Coast Guard Auxiliary offers. In order to graduate, students must complete BAR and one Area of Concentration, participate in the weekly all-hands Leadership Lab for the duration of their membership, average 60 hours of volunteer work for each semester of membership, and average a score of 4 (on a 1-7 scale) on their leadership evaluations during their final semester in school. Each student is also assigned to one or more collateral duties, mirroring Flotilla Staff Officer functions, or leadership positions (Detachment Commander, Detachment Executive Officer, or a Squad Leader). The Detachment at The College of William and Mary is a subsidiary component of Flotilla 67, District 5 Williamsburg, Virginia, and all students hold membership in that flotilla. A non-student member of the flotilla serves as Detachment Leader and performs the duties of the program's director, responsible for the program and its students, and reporting directly to the Flotilla Commander. Other flotilla members serve as "program staff" in such roles as Campus Liaison Officer, responsible for recruiting and relations with the university, or Leadership and Management Chief, responsible for facilitating the weekly Leadership Lab course and working with students to develop leadership, management, and professional skills. The Flotilla Commander, Flotilla Staff Officers for Member Training and Personnel Services are also heavily involved in the program as students are enrolled and participate in ongoing operational training. The William and Mary program has benefited from Auxiliary and active duty instructors volunteering to teach weekly or as guest lecturers in boat crew, vessel examinations, marine safety, and various Coast Guard and leadership-related topics. Members have benefitted from guest lectures given by Admiral James Loy (Ret. ), former Commandant of the Coast Guard; Rear Admiral Robert Reilly (USN), Commander of Military Sealift Command; Captain Christopher Calhoun, Innovation Team Leader from Headquarters; and Lieutenant Commander James Goodbow, Fifth District Chaplain. Andrew Welch, formerly Flotilla 67's Detachment Leader at William and Mary, was recently selected to manage the program within the National Training Department. While still in the planning stages, it is expected that future expansion efforts will involve training for prospective program staff and instructors, considerable TLC involvement with host institutions during program establishment, and ongoing support of the sponsoring flotilla's efforts once a new program gets off the ground. Flotillas with questions or an interest in establishing a new program are asked to contact Welch at andrew.welch@cgauxnet.us.